Don’t you just love sandwiches? The thing that I adore about them is that you can eat them any time of the day and you can make them as healthy or unhealthy as you want (or whatever you have in your fridge). Back in school I used to live on egg omelette sandwiches with pickles - I know it sounds gross but it was so good back then. Anyway, here is my new favourite. Let’s say the „grown-up” version of egg omelette sandwich with all the additional goodness of ham, mozzarella, spring onion and this homemade lemon curd. It’s one of those go-to recipes when you want something soothing, comforting and delicious after a hectic day but you can’t be bothered to spend the evening in the kitchen. It’s super easy to make but the one thing to remember is that the lemon curd has to be prepared in the morning (or evening) before, as it needs to chill in the fridge for about 2 hours. Besides that you are ready to go. Also, if you are not too fond on mozzarella you can use goat cheese or any other cheese you like. Hope you give it a go. Enjoy! Ham, mozzarella, egg omelette and lemon curd sandwich. Whisk together sugar and yolks in a saucepan. Add butter, zest, and juice, and whisk until smooth. Place over medium heat, and cook, stirring, until curd is the consistency of loose pudding, 8 to 10 minutes. Pour curd through a strainer into a bowl, and press a piece of plastic wrap on the surface of the curd. Chill for 2 hours. 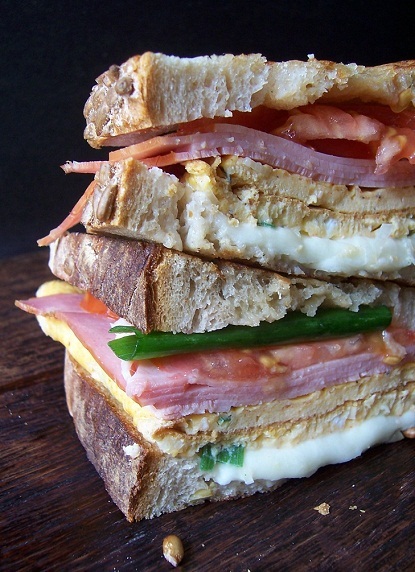 To make each sandwich, heat a nonstick skillet over medium-high heat. Brush one side of each bread slices with butter and place in skillet, buttered sides down. Place on one of the slices the mozzarella and toast, about 1 minute or till the bottom of the bread is golden brown and the mozzarella a bit gooey. Transfer slices to a plate, toasted sides down and spread about 1-2 tbsp. of lemon curd over the other toasted bread (not the mozzarella one). Meanwhile, whisk 2 eggs in a bowl with some salt, pepper, spring onion and add to skillet. Cook it for about 30 sec. and flip it over to the other side for another 30 sec. until just set. Fold up omelette in half and place on top of the gooey mozzarella bread slice. Place 5 slices of ham on top of omelette. Place a few slices of tomato on top of the ham, then top with the bread slice slathered with lemon curd. Repeat with remaining ingredients to make 1 more sandwich. Ta-dah! P.S: Also, happy 4th of July to you all! Enjoy the day BBQ -ing and celebrating. I'll see you all tomorrow morning. Love! P.P.S. Plus, here are a few more of my favourite recipes: lavender lemonade, peachy popsicles, caramel candy and poached egg and avocado toast. (Photos by exPress-o. Layout by Ana Degenaar - Blog Milk for exPress-o. Thank you Ana for your help with this series). I read your blog daily and I don't really comment but just wanted to let you know that I love your new food series. We made the caramel candy last week and the lemonade last night. Now I can't wait to try this sandwich. G.
Being as picky as I am, I love to try new food. This sandwich looks yummy. It will definitely perk up the taste buds. Happy 4th! Aww G, you made my day. Thank you for your sweet comment.